That’s just about how many unique visitors Digital Marketer has driven to our site with emails in the last 6 months. So… how are we doing it? Besides having a solid email marketing plan, it all starts with the subject line. Today we’re taking a deep dive into using Unicode Symbols (sometimes called glyphs) to make your subject lines stand out. Once you’re ready to roll with Unicodes, download the nifty Unicode Swipe File for 101 Unicode symbols guaranteed to work on 99% of all email clients at the bottom of this post. Unicode symbols act as a pattern interrupt. It’s a classic sales technique wherein the seller does something unexpected in order to break through barriers of indifference or resistance. Then the enthusiasm from the opt-in is over — they cool on your relationship. To get these less enthusiastic people to open your mails, you need to catch their eye in the inbox. By including symbols in a space populated entirely by words, you create a magnet for those eyes. It’s like hitting the reset button on your communications. This isn’t just theory – at Digital Marketer we’ve seen just how effective these kinds of subject lines can be. Yet both of these tests saw an 8% lift in email opens! This is particularly exciting because we didn’t have to change anything but our headline in order to drive around 1,000 extra sets of eyeballs to each of these mails. We aren’t the only ones who have seen how powerful Unicode symbols can be. ReturnPath.com did some in-depth research across a variety of different industries and found some very interesting results. Symbols can actually significantly increase the number of mails marked “not spam” that have hit the spam folder. And finally, when symbols in the subject line match the content of the accompanying text, they increase email open rates. Access your ‘How to Get Into the Email Inbox’ What’s Working Now in Digital Marketer Lab. While we know Unicode symbols can give your emails a boost, they only help when used correctly. 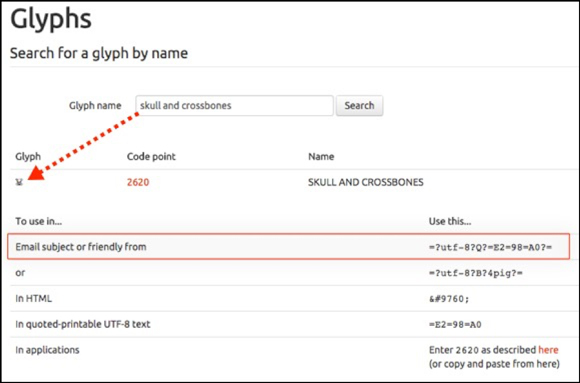 You can find a relevant symbol for just about any circumstance using the glyph search tool. Match Symbol to Subject – The consistency principles of ad scent are just as relevant with emails as with paid traffic. Don’t use unrelated symbols just for the sake of spicing up your subject lines. Avoid Ubiquitous Use – Overdoing it with Unicode symbols lessens their effectiveness and can hurt your customer relationships. These symbols are best used sparingly, to draw attention when you’re discussing something particularly valuable or interesting to a customer. When used too frequently, the novelty of the symbols will wear off, and your emails will become more white noise in the inbox. Testing is Critical – Different symbols will work better with different audiences (and different promotions). You should experiment with what works best for your particular business. Now that you know the why and when of Unicode symbols, I’ll give you the how. There are two primary ways to add these symbols to your emails: dragging and dropping and MIME Encoding. These techniques should cover the vast majority of email services, but if you hit a snag, just ask your Email Service Provider exactly which technique works best in your client. The first strategy is also the easiest: just drag these symbols into your subject lines. Simply copy and paste the code into the subject line space in your email client and you’ll be good to go. For some of the more finicky clients, there are other means of adding these. Check out specific instructions if you’re a user of InfusionSoft, Get Response, or Constant Contact. While there is a technical side to Unicode symbols, they require a bit of creativity and personality as well. Businesses that fail to do something interesting with these glyphs will quickly lose any lift in engagement they provided. Let’s look at some subject lines that effectively put Unicode symbols to work. Sometimes it’s not about just drawing they eye, but actually using these symbols to tell a story or share information. Poncho, a weather notification service, actually uses Unicode symbols to let their list know what the day’s weather will look like. 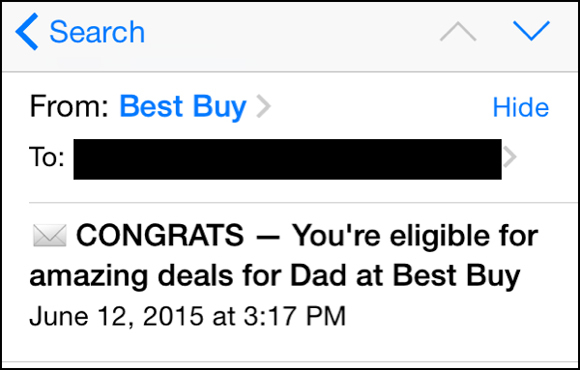 This example from Best Buy is a blast from the past! They’ve used their subject line to recreate an old direct mail strategy — letters celebrating the recipient and announcing exclusive access to a discount. This one from Express does a great job of highlighting the scarcity of their offer without going overboard. By drawing attention to the time their discount ends (when the moon and stars are out), they can intrigue their audience without hitting them over the head with too many high-pressure urgency messages, reducing list exhaustion. Check out Code School’s winning symbol for congruency. 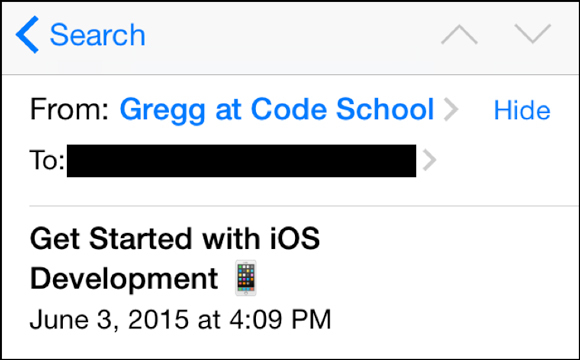 They added an iPhone to their subject line about iOS development, an eye-catching and appropriate graphic for their message. This is admittedly a bit of a gamble because that image is only available on iPhones — other email clients will just display an empty box. But they gambled on this design and it succeeded at convincing me to take a look at their message. Ultimately, the most important thing is for your emails to look enticing to your list when they hit their inbox. But not all symbols are created equally – some look great across the most popular email services, some do not. And when you factor in the appearance on mobile devices, tablets and desktops, it gets even stickier! Based on Digital Marketer’s testing, we’ve found that overall, web-based email clients do a great job of displaying Unicode symbols. Desktop clients also work well, excluding older versions of Outlook. Emails on iPhones actually work best of all because the platform replaces Unicode symbols with comparable emojis. This adds an additional burst of eye-catching design. There is a one platform where symbols struggle – Android devices. Our testing found that 1 in 5 common Unicode symbols did not translate to the Android platform. So, if a large portion of your email list is on Android devices, it’s worth doing some in-depth testing before you broadcast your emails. There’s a lot of variety when it comes to individual symbols, which can take some serious time and energy to see what works and what doesn’t. Fortunately we’ve done the legwork for you. Download our Unicode Swipe File now and get 101 tested Unicode symbols, along with their hex code, MIME code, and email client compatibility.